Engraved by Rob. Thew (Engraver to H.R.H. 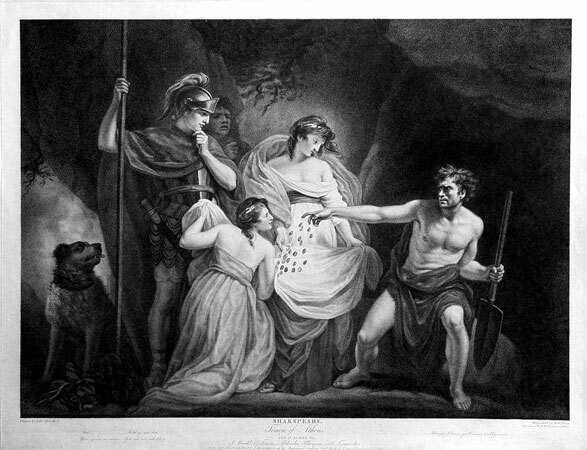 The Prince of Wales) / Painted by John Opie R.A.
One of eigth large and most decorative engravings and etchings with stipple engraving after impressive dramatically Shakespeare performances. By J. Caldwell and T. Ryder after J. Durno and G. Hamilton, P. Simon and W.C. Wilson after H. Trefham and J. Northcote. Published as „Shakespeare Gallery“ by J. & J. Boydell, London 1793-1803. Dimensions: approx 44 x 60 cm (17.3 by 23.6 in). Inscribed with the title, publisher adress and signed within the plate. Fine and rare prints. Unframed and without matting. Various original conditions, some excellent others with small traces of use, slightly dusty and/or light crease marks and/or small tears at the outer margins and outside the platemarks. Altogether absolutely acceptable conditions.